In the last couple of posts, we discussed how to set up and execute various commands of the Postman API testing tool. In this part, we’ll discuss the Newman CLI tool, which is helpful for developers and testers when running API calls/collection in the command line. For basic execution, please refer to Part 1 and Part 2 of this blog series. Newman is a command line collection runner for the Postman API testing tool. It gives you the provision to run and test a Postman collection directly from the command line. It is built with extensibility in mind, so you can easily integrate it with your continuous integration servers and build systems. Newman maintains feature parity with Postman, and allows you to run collections just the way they are executed inside the collection runner in the Postman app. In order to run Newman, ensure that you have Node.js version higher than v4. A copy of the Node.js installable can be downloaded from: https://nodejs.org/en/download/package-manager. The easiest way to install Newman is using NPM. If you have Node.js installed, it is most likely that you have NPM installed as well. The newman run command allows you to specify a collection to be run. You can easily export your Postman Collection as a JSON file from the Postman app and run it using Newman. If your collection file is available as a URL (such as from your cloud API service), Newman can fetch your file and run it as well. The results of all tests and requests can be exported into a file and later imported into Postman for further analysis. Use the JSON reporter and a filename to save the runner output into a file. Custom reporters come in handy when one would want to generate collection run reports that cater to very specific use cases. 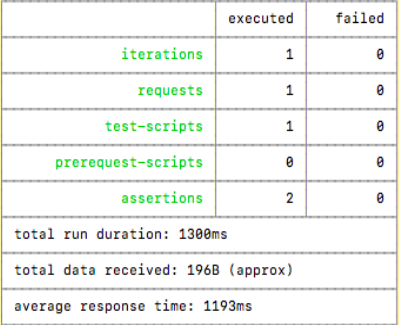 For instance, logging the response body when a request (or its tests) fail, and so on. A custom reporter is a Node module with the name of the form newman-reporter-<name>. Publish your reporter using npm publish, or use your reporter locally. Scoped reporter package names like @myorg/newman-reporter-<name> are also supported.